We design sails for being the fastest on the water. If you buy a slalom sail what do you want? To be the fastest! We go without any compromise towards this direction with all our AC-Lines. The moment you are choosing a slalom sail, it means that you have the level to want the best performance and challenge anyone else on the water. This is what we focus on our development for the AC-X, and why the magazines say, that this is the fastest no cam slalom sail! 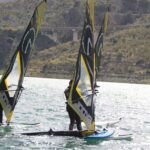 The moment you go on the water with a slalom sail, you go on the water with the right size for the wind, or even a little overpowered, and this is where we want the AC-X to give you the best performance to be able to shock who will not be on the Black Sails! We do test our AC-X against racing sails, so we try to bring it to have the same performance, taking out the annoying part of the cams out and leave the racing blood into it. The goal is to keep speed at full throttle all the time, without having the rider to lose energy after even more hours on the water. Minimum energy for max speed! The batten displacement, the outline, the tension in the sail body, the opening of the leach, is the reproduction on what is in the AC-One. The challenge is really to make a no cam sail feel like it has the same comfort of a cam sail when needed. We want our sail to accelerate to endless speed, and nothing else. Used in marginal winds, the AC-X does feel like a Ferrari being used to do the mid-week shopping! Nevertheless, despite its taught nature making it feel a little stiff in the hands, the lowdown Dacron luff sleeve does allow the draft to breathe, deepening the profile and providing more useable feedback than the previous models. The centre of effort is also positioned relatively high and back in the draft, helping the AC-X provide more obvious power in the light airs. Once planing the acceleration, provides is simply another level – it seems to find another gear with every subsequent gust. It demands being paired with a fast-free race or slalom board – something that has the capacity to keep up with it! When you venture into powered and overpowered conditions, you discover the AC-X’s true personality – it is a true free race thoroughbred, finding favour with the taller, heavier rider that can use the energy it delivers. The centre of effort is locked firmly in place yet comes from such a high location that it best suits those with an assertive riding style. It helps lift the rider’s stance and push the board’s speed, making it fly on its fin. Carry this speed into the turn and the AC-X has the balance and handling to reposition easily, the lower luff panel breathing to soften the delivery and provide the extra low-end power to complete the transition efficiently. One of the most potent top end engines, if you have the board and mettle to keep up with it, you simply won’t be beaten across the water. Rig it right and feel its arrogance!